Enchant creature Enchanted creature gets +3/+0 and can't be blocked except by two or more creatures. I greatly appreciate Madcap Skills as a wincon. My favorite common from all of RTR block. Maybe try using Molten Rain in place of Violent Impact ? 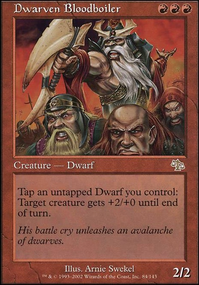 I like the deck's idea, but, since you need to be very fast, why don't you replace Frenzied Rage with Madcap Skills and Short Sword with Bonesplitter ? 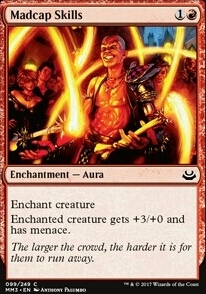 Similar story for Dismissive Pyromancer : basically you have an easily destroyable creature, that let's you discard a card in order to draw one (and, since you don't have ways to draw cards, sometimes would not be so usefull) or, for the cost of 3 mana, deals 4 damage to an opponent and then dies. Is it worth? Could Fatal Frenzy be usefull here? Cartouche of Strength, which doubles as removal and a solid +3/+3 trample buff to Uril. If there's an annoying creature that's less than 8 toughness, it's dying, lol. 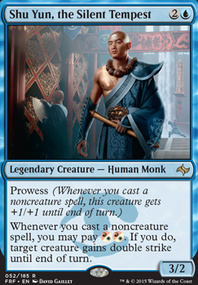 Another card to not sleep on is Tilonalli's Crown, which gives Uril a whopping +5/+2 and trample for only 1R. Similarly, Madcap Skills gives Uril +5/+2 and menace which is pretty reasonable evasion (turning him into a 10 powered beast is pretty huge). Shielded by Faith is one of my favorites. You can slap it down on something silly before you get to 5 mana in order to cast Uril (I've put it on Birds of Paradise on turn 2, then t3'd Uril and moved the aura to him). It's not as powerful as Shield of the Oversoul but it is still pretty powerful and flexible due to the fact that once Uril becomes hexproof and indestructible, the number of cards that can answer him drops dramatically (requiring things like Cyclonic Rift, Merciless Eviction, Hallowed Burial, etc., instead of just any old Wrath of God clone). Chandra's Ignition is a card I've found fairly amusing and it may be very powerful in your meta. Dealing 12 to all opponents and their creatures is a fantastic way to open up the field to swing in and attack. 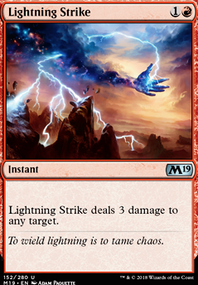 Impending Disaster- this card seems janky, and it probably is a little bit, but it's a great card to windmill slam the turn after casting Uril. 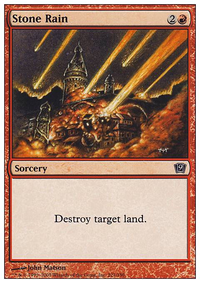 This + an aura typically makes opponents scramble, and it either does one of two things: It forces them to spend removal on it, instead of the aura on Uril (or Uril himself by casting a Wrath or something), or it causes all lands to go to the graveyard. Either way, you wind up with a big creature on board and happiness in your heart. Burgeoning or Exploration- I run both, but one of these would probably be huge as either one could enable t3 Uril which is typically where you want to be. Spectra Ward. I originally ran this too, but it causes a problem: It has to be the last aura you put on Uril, or else you can't target him to put any more auras on him. 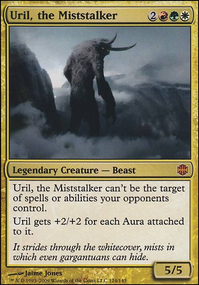 It's more than a little problematic considering Uril already has reasonable protection with his inherent hexproof, and there's plenty more auras that give evasion for a lower cost. Serra's Embrace is pretty much worse than Tilonalli's Crown. Entangler- You want Uril to be attacking, not held back to be a blocker. Unless you give him vigilance, this card isn't worth it as it doesn't help his offensive capabilities as much as other cards (and all you really want to do is smack someone in the face with him until they exit the game lol). 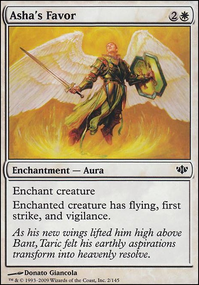 Avacyn, Angel of Hope- She just costs way too much. By the time you can cast her, you should have a couple of dead opponents already. Faith's Reward- you already run Replenish and Retether. This one is a little bit too much. 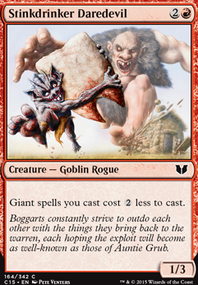 If you're afraid of board wipes, Boros Charm is substantially more flexible, can be used through graveyard hate, etc., and is much cheaper to boot. Mayael's Aria- if you have a 20 power creature, you should have won the game already anyway. I find this card incredibly redundant and its first two abilities aren't worth spending the 3 mana for. Anyway, hope this helps. Uril's one of my favorites. Vexing Devil is a great burn deck creature. Burn is all about speedy play and this creature is mega speedy. What's better than 4 damage for 1 mana? 4 damage each turn after your opponent refused to take the direct damage. Madcap Skills can make your turn one or two creature keep swinging after your opponent plays a blocker. I often find myself saying this when I use it: "Oh? You played one blocker? Okay. How about I play Madcap Skills and hit you for 3 more than I did last turn? No response? Great!" :P I was introduced to this trick by The Best $20 You'll Ever Spend, a deck which carried me through a few FNMs when it was in standard. Spark Elemental, Hell's Thunder, and Ball Lightning are 2 other fast creatures which have different variants of evasion. These can do fast damage. Hellspark Elemental is an arguably worse yet still noteworthy alternate version of Ball Lightning and Spark Elemental. This card is intended to be a fallback when you don't have other spells in hand, which can happen with a fast deck that drops multiple spells per turn. Vexing Devil and Ball Lightning cost a pretty penny, because they're worth it if you want maximum efficiency. Madcap Skills I believe is a highly underrated card. Awesome to see it in the list!